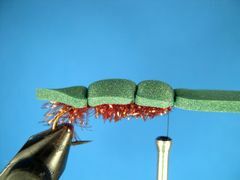 This foam bodied terrestrial is easy to tie and a lot of fun to fish. It's a great fly during hopper time in late summer and early fall. 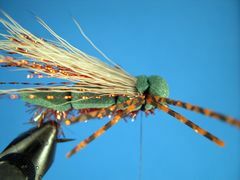 Darren's Cicada is made with a foam body and a deer or elk hair wing. 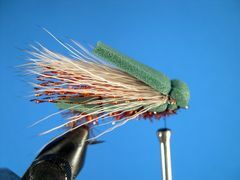 It's named after it's creator, Green River guide Darren Bowcutt of Trout Creek Flies in Dutch John, Utah. I have fished with Darren during Cicada Hatches on the Green and it was dynamite on big rainbow and brown trout. 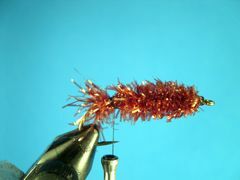 I brought the fly home and found that it was just as effective on local bluegills and bass. I decided to modify Darren's fly by substituting a green foam body for black and tried it on local bluegills and bass later that summer. With great success, I might add. 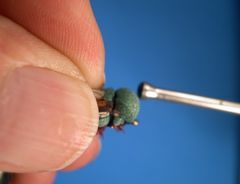 The overall length of Darren's Cicada is one and one-quarter inches. 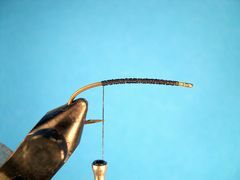 The TMC 2312 is a 2XL hook designed for hopper imitations but 1XL dry fly hook with a straight eye also works well if you drop down from size 6 to size 4. 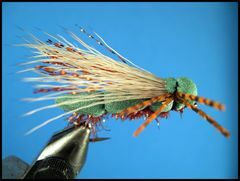 I fish this fly like I would fish any other hopper pattern on still water. Cast it close to shore and try to make it land with a "splat" just like a real hopper would do. Keep it still for several moments before you wiggle it ever so slightly. Catch a live hopper, toss it on the water, and observe it's movements. 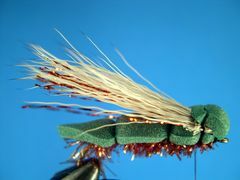 Try to mimic the struggling motion of the live hopper with your fraud and you will be fishing it properly. Start the thread at the hook's eye and lay down a thread base from the eye back to the hook's bend. 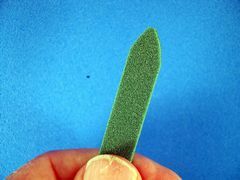 Attach a four inch piece of Cactus Chenille. 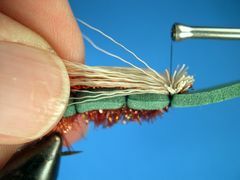 Move the thread to the front of the hook and wrap the chenille forward to the hook's eye. Keep the previous wrap out of the way with your thumb and index finger of your left hand as you wrap the chenille forward with you right hand. Tie off the chenille and remove the thread. Trim the Cactus Chenille on the top, bottom, and both sides with your scissors. 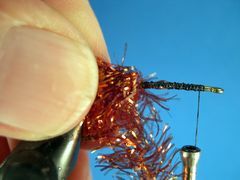 Re-attach the thread at the rear of the hook as shown with a jam knot. Prepare a piece of 1/16th inch thick foam. 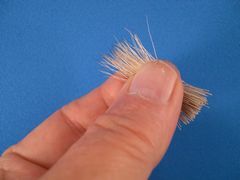 The piece should be about one and one-half inches long and 3/8th inch wide trimmed at one end as shown in the photo. 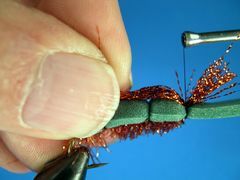 Tie down the body as shown by first taking a couple of wraps of thread to bind down the foam at the rear. Next, take a wide turn of thread to the point where you want to bind down the foam for a second time. Finally, take another wide turn of thread almost to the hook's eye and bind the foam down for a third time. 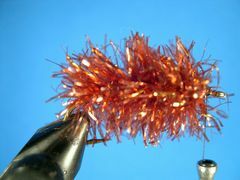 Tie in a small bunch - 20 to 25 strands - of Crystal Flash. The flash material should extend slightly beyond the tail end of the foam body. Remove a clump of hair from the skin that's about the thickness of a lead pencil. Comb out the underfur and even the hair tips in a hair stacker. Tie in the hair as shown. 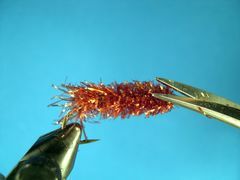 The tips of the hair should extend about 1/4 inch beyond the crystal flash. Fold the foam back over the wing and bind it down to form the head. Trim off the excess foam material so that the head looks like this. To give the Cicada leggs tie in two pieces of legging material on the left and the right side of the head Madame X style. 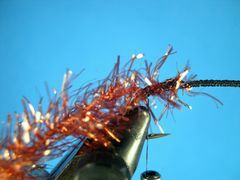 Move the thread to the front of the head just behind the hook's eye and tie off with two half-hitches or a whip-finish. Your version of Darren's Cicada is finsihed.